We have argued that not only have U.S. farmers increased cropland acres during the recent commodity boom, they have improved the productivity of existing acres. Driving across the Corn Belt I’ve noticed several new irrigation systems being put up in recent years. This is one obvious example of an investment aimed at improving productivity. A trifecta of events – high grain commodity prices, record net farm income, and the 2012 drought – has seemed to fuel interest in irrigation. 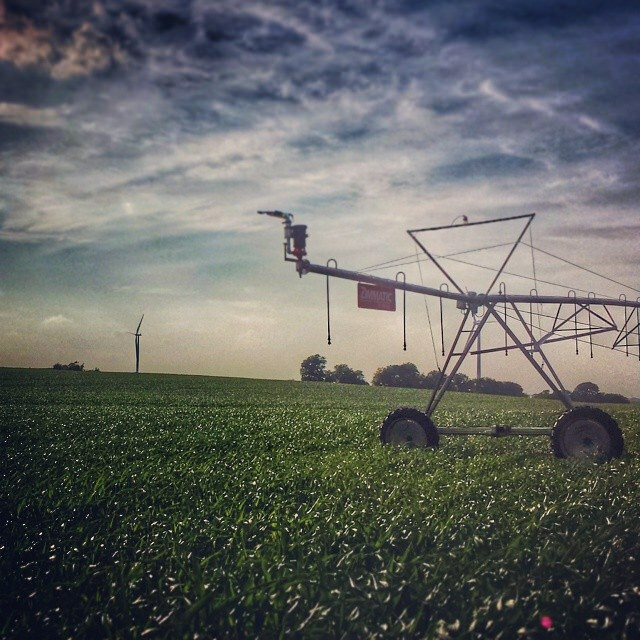 In this post, we looked at the irrigation data across the county to identify the trends that have emerged and see how windshield observations line up with the reality of data. Specifically, the acres of irrigation and the intensity of irrigation was evaluated. According to USDA, there were 55.8 million irrigated acres in the United States in 2012, representing 6.1% of all land in farms. Since 1997, the USDA’s Farm and Ranch Irrigation survey has reported between 55.3 and 56.6 million acres of irrigated acres. Overall, there has been very little change in the number of acres being irrigated since 1997. In figure 1, the share of total irrigated acres by state is shown. Specifically, the top 10 states, which collectively account for more than 70% of all irrigated acres, are included. Nebraska and California are the top irrigating states by acres and together account for nearly 29% of total irrigated acres. Figure 1. Share of Total Irrigated Acres in U.S. by state. Top ten states shown. Data Source: 2013 USDA Farm and Ranch Irrigation Survey. Some interesting trends emerge when one looks at state-level changes in irrigation from 2008 – 2013. Figure 2 highlights the change in irrigated acres for the states with the largest increases (top 10) and largest decreases (bottom 10) in acres. The most interesting observation is where the changes occurred. In general, the states that increased irrigated acres were from Southern states and a few Corn Belt states. States with decreases in acres were predominantly in the West. Figure 2. Top/Bottom 10 States for Changes in Irrigated Acres from 2008 – 2013. Data Source: 2013 USDA Farm and Ranch Irrigation Survey. Another important consideration for irrigation is the intensity at which irrigation is being utilized. In figure 3, the states with the highest water usage is shown. Overall, a wide variation is reported. As one would expect the drier Western states tended to be the most intensive irrigation users. For example, Arizona reported average water usage at 4.4 acre-feet per acre. This is considerably more than other states. California, for instance, reported water usage at 3.1 acre-feet per acre while Idaho was at 1.8 acre-feet per acre. It is worth noting that Nebraska, which had the highest share of irrigated acres (figure 1), reported water usages at 1.0 acre feet per acre in 2013. Figure 3. Average Irrigated Water Usage by State, acre-feet per acre. Data Source: 2013 USDA Farm and Ranch Irrigation Survey. For the U.S. broadly, the water applied per acre has been on a downward trend. In 1998, the rate was 1.8 acre-feet per acre and declined to 1.6 acre-feet per acre in 2013. It’s important to keep in mind that several factors impact water usage rates, including the crop being raised and weather conditions. These data are for a single year (figure 3) and significant fluctuations from year to year can be expected, especially where irrigation is supplementing primarily rain-fed systems. Across the country, irrigated acres have held fairly constant with a small decrease in the amount of water applied, per acre, over time. At the state-level, states in the Corn Belt and South have increased irrigated acres while those in the West reduced acres. Additionally, the intensity of irrigated varies greatly at the state level. While Corn Belt states such as Illinois and Wisconsin increased irrigated acres, the rate at which irrigated acres have been added has been relatively slow, less than 2.5% annually from 2008 -2013. Still given the tremendous amount of cropland in the Corn Belt, even small annual changes can add to meaningful numbers of acres. As commodity prices moderate it will be interesting to see how this trend evolves. Overall, trends in irrigation usage will largely be driven by irrigation water availability, cropping needs, farm income, and broad weather conditions. In areas where irrigation water is available, dry and drought conditions are short-term, and strong incomes are possible an expansion of irrigation will be likely. On the other hand, areas with limited irrigation water and persistent drought will likely continue to decrease acres over time.